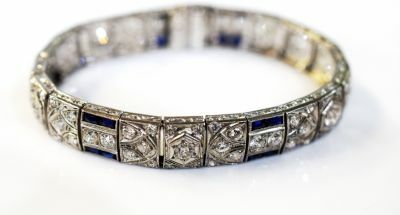 A beautiful Art Deco mill grain and engraved platinum bracelet featuring 12 old European cut diamonds, est. 1.53ct (SI clarity: G-H colour) 5 old European cut diamonds, est. 0.84ct (SI clarity: G-H colour); 75 old European cut diamonds, est. 2.38ct (SI clarity: G-H colour); and 24 four scissors cut synthetic blue sapphires (typical of that Era), est. 3.20ct. It has a concealed safety clasp and is approx. 6.5 inches (16.51cm) in length. Please make an appointment to see this beautiful bracelet or contact us for pricing information.